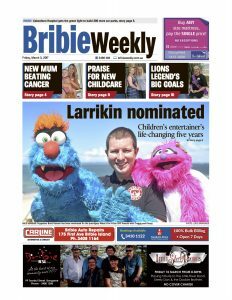 Brett, Troggg and Flossy made the front cover of the Bribie Weekly today – Friday, March 3 2017. The article was later published online at the Caboolture News. 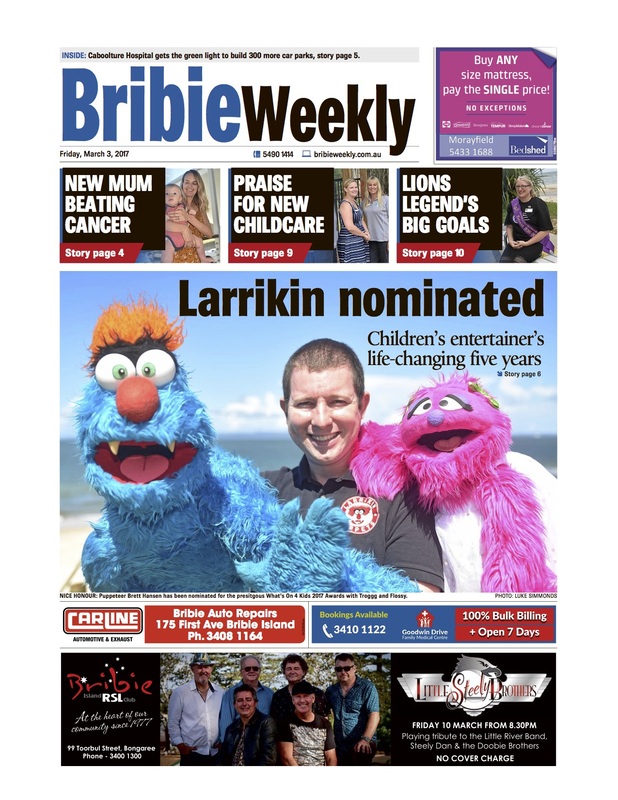 The article talks about Brett’s story of the events that lead to the founding of Larrikin Puppets in 2012. It also mentions our time overseas in the USA. 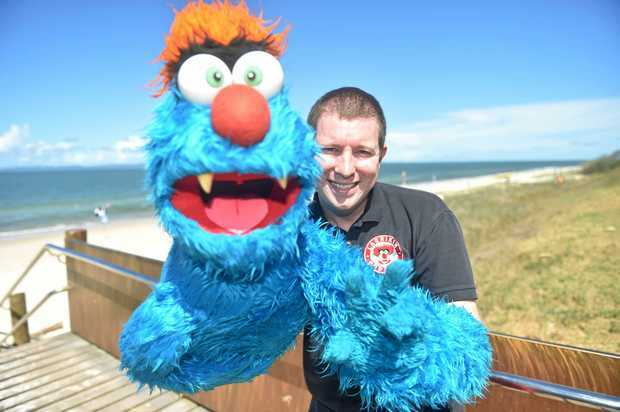 Puppeteer Brett Hansen has been nominated for the prestigious What’s On 4 Kids 2017 Awards with Troggg and Flossy. Photo by Luke Simmonds. WHEN Brett Hansen’s life fell a part, he never expected it would kick start the best five years of his life. He spiralled into darkness after years of not being able to hold down a ‘normal’ job and in 2012 he became unemployed and divorced his wife. But that same year he auditioned for a role in the first Brisbane-based production of The Muppets musical parody, Avenue Q, which turned his life around. “I was three when I started watching Sesame Street and The Muppets … I used to make puppets out of handkerchiefs and socks and my parents bought me a couple of puppets,” Brett said. “I taught myself how to use them and I performed puppet shows for the family, at the school library and wherever I could. “It’s a part of me I never lost and it’s why I struggled with every day jobs that I wasn’t very good at. Brett had no acting experience, but years of self-taught puppeteering experience not only landed him a role, but a job as puppet trainer for the whole cast. “I was blown away; I’d imagined how good it’d be and get a call up to be accepted and it was like a dream come true,” he said. Brett went on to study advanced puppetry in Texas with The Muppets trainer Martin Robinson and meet Kermit the Frog and Miss Piggy. 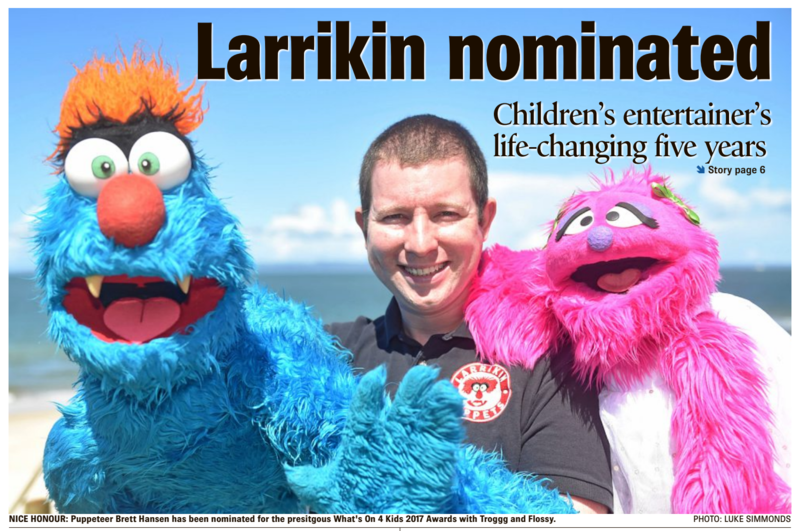 He’s brought his new-found skills back to Australia for his live show company Larrikin Puppets, which has been nominated for Best Children’s Party Entertainment at the prestigious What’s On 4 Kids 2017 Awards. Fellow Bribie Island region group Kangagang has also been nominated, but for Best Children’s Live Entertainment. 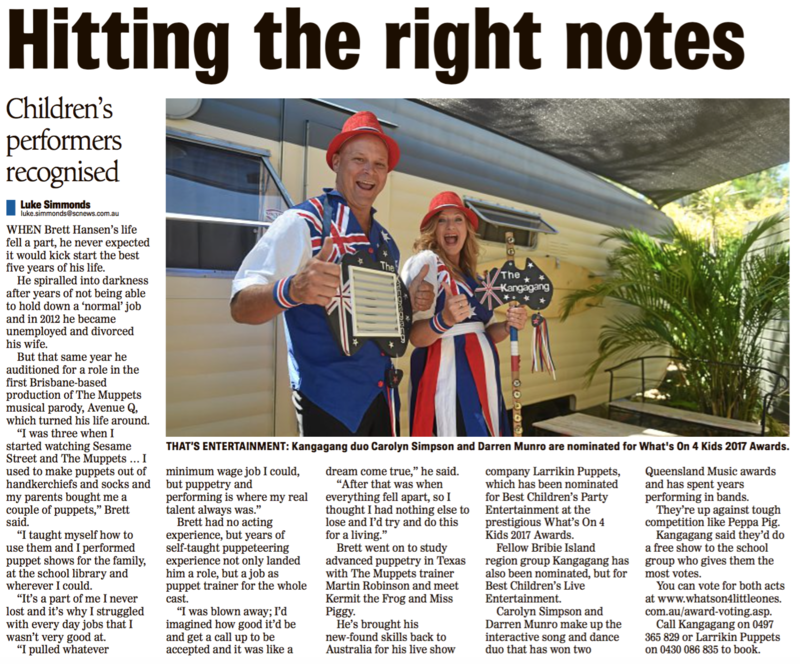 Carolyn Simpson and Darren Munro make up the interactive song and dance duo that has won two Queensland Music awards and has spent years performing in bands. They’re up against tough competition like Peppa Pig. Kangagang said they’d do a free show to the school group who gives them the most votes. You can vote for both acts at www.whatson4littleones. com.au/award-voting.asp (Note: Voting now closed). Call Kangagang on 0497 365 829 or Larrikin Puppets on 0430 086 835 to book.